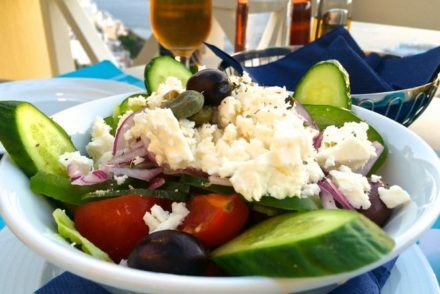 Is the Cretan Diet the “real” Mediterranean diet? There has been a lot of discussion on whether the original Mediterranean diet is actually the Cretan diet. Cretan Dietitian/Nutritionist Christina Makratzaki explains why. Twenty-three countries surround the Mediterranean Sea. How can all these countries, which differ in culture, religion, geographical location, products, socioeconomic status, have a single diet, called the Mediterranean Diet? Is the term Mediterranean Diet misleading? In Northern France they consume butter, while in the southern regions they consume olive oil. The highest consumption of saturated fat is seen in northern Spain as opposed to southern Spain. The northern regions of Italy do not appear to follow the Mediterranean diet model. Now let’s see in more detail the characteristics of the Cretan diet and how it differs from other Mediterranean countries. Fat makes up about 35%-40% of daily calories in the Cretan diet. 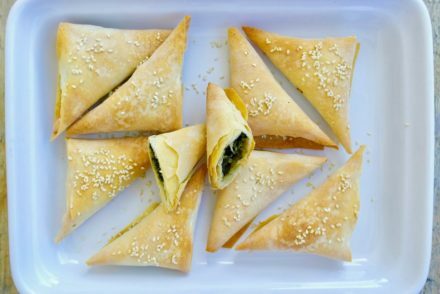 Cretans get their fat from olive oil and olives instead of butter and meat. Various studies have found that Cretans had the highest intake of olive oil compared to other Mediterranean countries; the amounts were much higher than what the Italians and Spaniards consumed. Cretans ate red meat only on holidays and every other week. The amount they consumed was about… 60 grams (2 ounces). Chicken was consumed on a weekly basis but also in small quantities. There is a difference between the Mediterranean countries in regards to the amount and type of meat that is consumed. 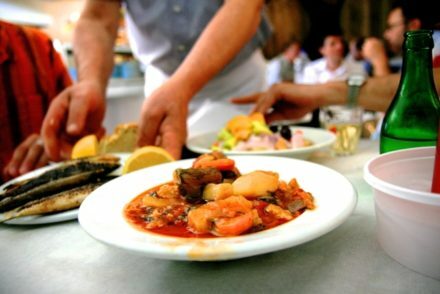 In Crete, fish is consumed 1-2 times a week. People living near the coast ate mostly fresh fish, while inland and in the mountainous regions salted fish was consumed. Cretans did not consume large quantities of milk. A glass of milk a day seemed to be enough, the rest of their dairy needs was fulfilled with cheese. Cretans consumed 2-3 eggs a week. Snails were among the main sources of protein, especially for the economically weaker groups. They were not consumed only during Lent but all year round. Renaud, head researcher of the Lyon study, said that the snails in Crete and Greece in general, contain more omega-3 fatty acids, compared to the snails of France. 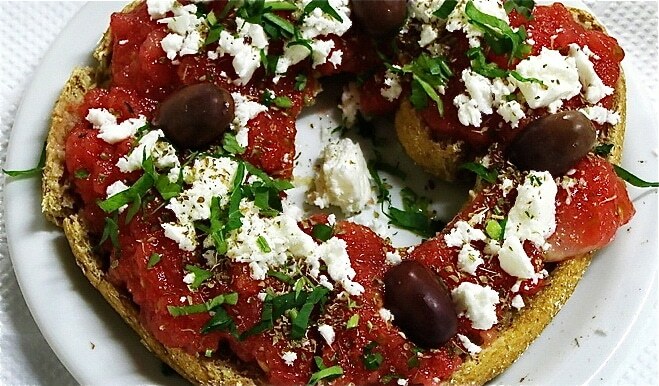 Cretans ate plenty of bread and rusks (paximadi) with the bran. White bread was consumed only during celebrations and holidays. They also consumed rice, wheat (xinochontros) and hilopites (a type of egg noodle). Cretans ate legumes (beans) 3 times a week. Their needs in starch were mainly fulfilled with beans and potatoes as opposed to pasta. In the seven country study by Physiology researcher Ancel Keys, it was observed that Cretans ate more fruit than any of the other Mediterranean countries. As for vegetables, the consumption was high, but what made the difference were the wild greens. In Crete you can find wild greens that do not grow anywhere else in the world (for example the wild stamnagathi). Studies have shown that these greens are good sources of omega-3 fatty acids, vitamin C and vitamin E.
Cretans consumed 1-2 glasses of wine a day. Christina Makratzaki, MSc is a Dietitian/Nutritionist based in Hania, Crete. An article that was published 14 years ago, under another by line. What’s the Mediterranean Diet and who is on it anyway…. Thank you Niki for your article! Wow Elena. So glad I found your site. I am a South African and browsing through realised that I have loved and enjoyed a semi med diet for many years. No one is going to talk me out of my daily breakfast of many years of a boiled egg tomato cucumber and a good half cup of yoghurt but loving the new ideas for bean dishes and salads! Thank you Henriette! Perfect breakfast by the way!